Two live-action films of Gantz, the ongoing sci-fi action manga by Hiroya Oku serialized in Weekly Young Jump was announced today. Starring Ken'ichi Matsuyama(Death Note, Detroit Metal City) and Kazunari Ninomiya(Letters from Iwo Jima), the movies will be released in 2011. High school student Kei Kurono and his best friend Masaru Kato wakes up in an unfurnished Tokyo apartment following their deaths by a subway accident. The story follows the bizarre life (or afterlife) of the two. Along with other individuals of similar circumstances, they have to go on missions to kill aliens living on Earth, assigned by a black sphere known as "Gantz". If they survive a successful mission, each individual is awarded points for the aliens they have killed. The only way to stop having to participate in the missions is to earn one hundred points, and choose the option to be freed. Ninomiya is casted as the protagonist Kurono and Matuyama as his best friend Kato. 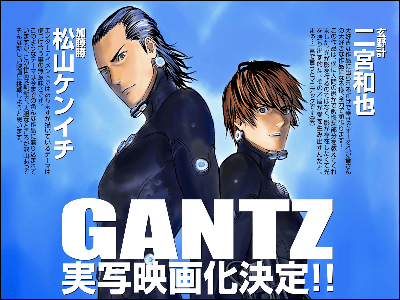 GANTZ has sold over 10 million copies to date, and it has been adapted to a TV anime series in 2004 by Gonzo. This is the first live-action attempt. The films will be directed by Shinsuke Sato of Lady Snowblood(2001), Sand Chronicles and Oblivion Island: Haruka and the Magic Mirror. The other crew includes screenwrite Yusuke Watanabe(20th Century Boys), producer Takahiro Sato(Death Note), special-effect director Makoto Kamiya(Cutie Honey, Resident Evil: Degeneration) and action-director Yuji Shimomura(Dororo, Death Trance). Digital Frontier(Summer Wars, Death Note) is in charge of the CG works. Other staff and casts will be unveiled gradually on the official website.